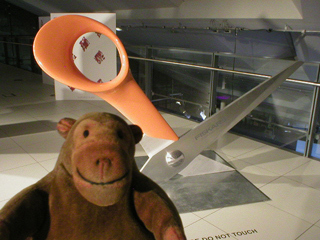 "I'm not going to find out how sharp they are"
Mr Monkey examined a very very large pair of scissors but didn't get too close to them, in case they were too realistic. Then he played about with some viral advertising on small computer screens and watched several adverts on video. 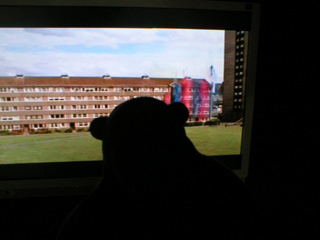 He was rather pleased to find out that the Sony advert showing paint splashing all over a tower block actually used real paint (well, real paint that would wash away easily afterwards) and not just computer animation.